The discovery was made at Sixteen Foot Bank in March. Witnesses are now being sought to catch the perpetrators. A Fenland District Council spokesman said: “The scale and audacity of this crime is shocking and will cost several thousands of pounds to clear up. Exposure to asbestos can also be a serious health hazard so we are working with our partners, including the Environment Agency, to investigate the incident, gather evidence and ensure the waste is removed as quickly as possible. “Witnesses are key to helping us identify who is responsible and we would appeal for anyone with information to get in touch with us at: streetscene@fenland.gov.uk. The Environment Agency said: “We received a notification this morning of the illegal dumping of asbestos on the Sixteen Foot Bank rural road. 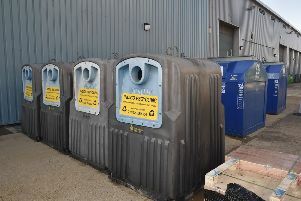 “We are working with Fenland District Council, who are removing the waste. “Waste crime can cause serious pollution to the environment and put communities at risk. Waste companies, local authorities and businesses all have a responsibility to check what happens to their waste. We urge people to dispose of asbestos using a registered waste carrier.